Artists Pedro Delgado, Justin Biliki, Art Sir and Rami Efal paid a visit to RMDH to celebrate the new year of the Rat with the kids, their parents and the house’s volunteers. 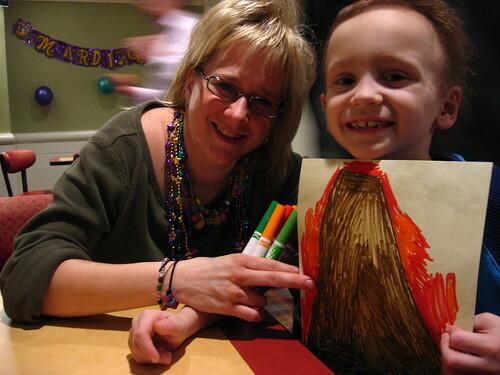 Little Nicholas drew this volcano after devouring three pizza slices, loving both equally. We have met children and their families from Texas, California, Michigan, Seattle(?) some of whom we met before and have been spending more than a year at the house. We wish them all good luck and good health on their journey to recovery.